← A manifesto of sorts…. ‘Becoming a mother makes your life twice as hard but twice as good ’ is the best summing up of motherhood I have ever come across. All too often, dialogue about mothering gets split along the overly-simplified lines of mothers who find it hard work vs those who find it a blessing, yet the simple truth is, it is both. They are two sides of the very same coin. There is no doubt that it is tremendously hard work to be a good mother, and for a lot of new mothers, this little fact comes as something of a shock. If I had a pound for every cry of ‘ I had no idea it would be so hard’ then at the very least my heating would be on full bore and I wouldn’t have cold fingers and toes. Very often as new mothers we get thrust into a world we had no way of expecting, and more often than not, the intensity and immensity of what it means to be a mother takes some serious getting used to. And yet getting used to it, or more importantly, accepting that it is hard work is the FIRST thing we need to do if we want to stay sane. The thing about motherhood is that until we have done it, we have no idea what it entails. As my grandmother used to say, ‘mothering is the only thing they don’t do degrees in’. And if it was true in her day then it is even more so now. In a time when ‘leisure studies’ earns you a qualification, motherhood can really feel like the last bastion of muddling through. There is an (often subconscious) assumption that because mothering is this natural thing that we are designed, in evolutionary terms at least, to do that we will be able to scoop up the baby after birth and skip through motherhood with little more than flowers in our hair and a permanent beatific smile affixed our face. And implicit in this (admittedly slightly exaggerated) assumption is that something natural could not possibly be the incredible hard work that it turns out to be. Yet the truth is, our instincts only take care of part of the picture. Even the most maternal of women will come up against elements of mothering that will be test them- often a lot. You might well find yourself very good at the nurture stage, happy to snuggle up with a milky smelling baby and able to cope with night after night of interrupted sleep, only to find that an opinionated toddler is the undoing of you. Other mothers spend their child’s entire babyhood proclaiming with dismay how un-maternal they are and how unnatural it all feels, only to find that they completely thrive when mothering becomes more of an organisational enterprise. Then, whilst the nurturers are all running late for school and have forgotten their reading record books for the umpteenth time, these mothers are waltzing in with children ten minutes early with children who have actually brushed their hair and then hot-footing it off to some exceedingly intellectual job. Whichever particular camp you fall into (both, neither?) mothering over the long haul is going to test your every resolve and strain your abilities but CRUCIALLY (and this is the magic bit) give you an opportunity to work hard and grow in the process. 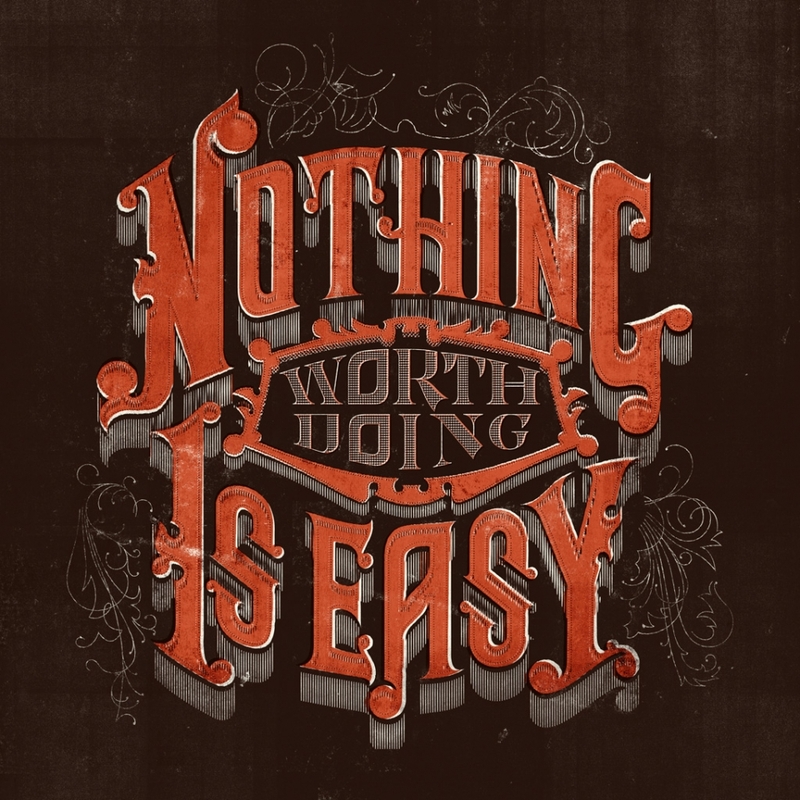 Nothing worth doing is easy, but as they say, nothing easy os worth doing either. Just because we are designed to mother doesn’t mean we will be any good at it at the beginning, that it will come naturally or isn’t just as hard- even harder- than anything else we set out to do well. But the sooner we accept that it is difficult, that it is meant to be difficult and that everyone else at some stage finds it hard too, then it will no longer be so. Because the fact that it is difficult will no longer matter. Malcolm Gladwell talks of the 10,000 hours it takes to be good at anything. As mothers we have a lot more than 10,000 hours to perfect our particular craft. And the sooner we see it as a craft we can hone, as a labour of proper love and as something we will have to work hard at, the quicker we can get on with just that. Picture borrowed from http://phraseologyproject.com/ – great website, worth a look! Enter your email to join my mailing list and I'll let you know whenever I've written a new piece. Lessons from a Summer Well Spent…..